‘Heart stopping’ – (almost) literally. That’s the way many fans and broadcasters described the final moments, and in particular that infamous play from the Seahawks, in the dying seconds of Super Bowl XLIX. Such outcomes are difficult to predict (see our pre-game blog, Predicting the 2015 Super Bowl MVP with data visualization). The closeness of the contest, between the elated New England Patriots (28) and the dejected Seattle Seahawks (24), was also reflected in this data visualization of US TV viewership of Super Bowl 49. An astounding average 114.4 million viewers tuned into NBC’s broadcast of Super Bowl Sunday, breaking 2014’s record of 111.5 million. For context, this makes the 2015 Super Bowl the most-watched television ‘program’ in US history. 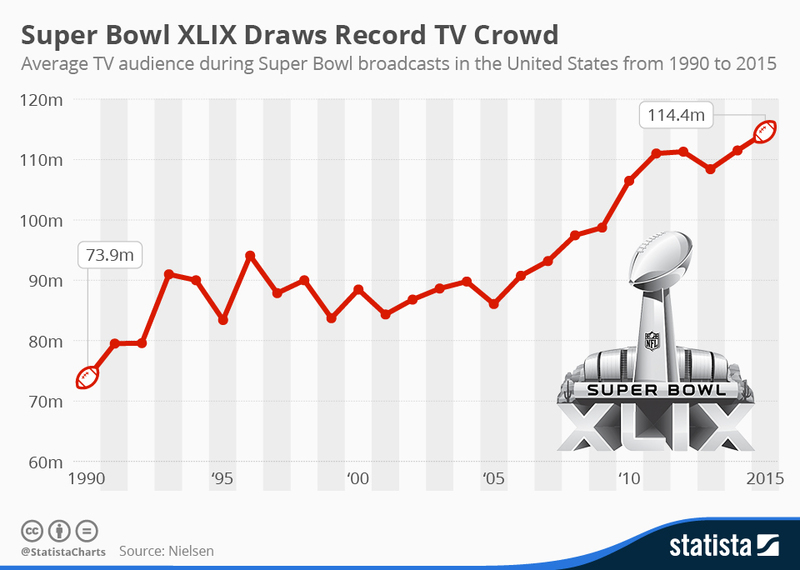 This outcome follows a trending pattern of increasing Super Bowl viewership over time. On top of that, 47.5 percent of all US television sets were tuned into the big game. It’s figures like these that explain why advertisers were prepared to pay $4.5 million for a 30-second Super Bowl commercial (for more on the economic enormity of the Super Bowl, check out our previous post, Analyzing the 2015 Super Bowl with data visualization). Now, if you’re a sports fan, you’ll know that you, and other sports fanatics around the globe, have many different rituals, routines and superstitions on game day. For instance, maybe you’re convinced that every time you walk out of the room, something bad happens. So, you create yourself a comfortable cove on the couch, and settle-in for the long-haul. You treat your game of choice like a religion. 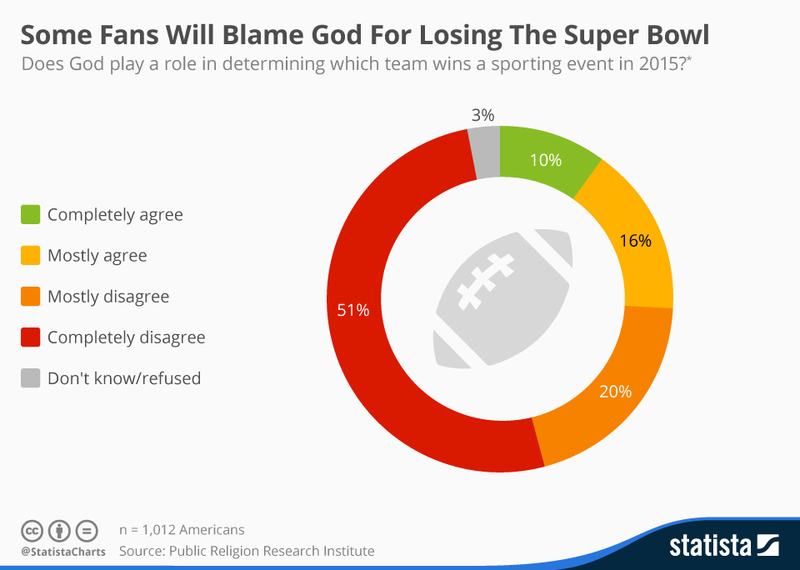 But, did you know that many Super Bowl fans actually believe that divine intervention influences the outcome? Maybe you’re one of them! A survey of 1012 football fans, by the Public Religion Research Institute, found that one in four Americans believe God has a hand in determining the result of sporting events. While 51% of survey participants “completely disagreed” with the premise, 10% “completely agreed” and 16% “mostly agreed”.